SCVHistory.com LW3233 | Film-Arts | Mexican Lobby Card: 'Bowery at Midnight' with Bela Lugosi, Monogram 1942. 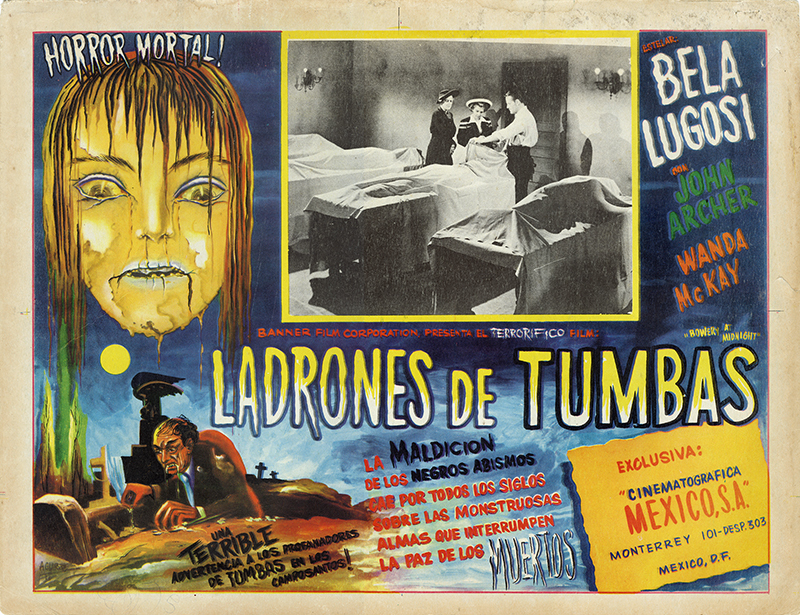 Mexican lobby card, 12.5x16.5 inches (standard size for Mexico), advertising the Bela Lugosi vehicle "Bowery at Midnight" (as "Ladrones de Tumbas," or "Tomb Robbers") from Monogram Pictures, 1942. At the same time Monogram Pictures executives Trem Carr and W. Ray Johnston were squeezing the last drops of star power out of aging Western luminaries such as Hoot Gibson, Buck Jones and Johnny Mack Brown at the studio Monogram rented in Placerita Canyon in the early 1940s, Carr and Johnston did the same thing in the horror genre with Bela Lugosi, whose career had peaked with 1931's "Dracula." Monogram Pictures Studio, early 1940s. Collection of Mark Wanamaker/Bison Archives. Lugosi starred in nine pictures for Monogram from 1941-1944, known to horror fans as the "Monogram 9." Produced by Sam Katzman's Banner Productions, the first of them ("Invisible Ghost" and "Spooks Run Wild" from 1941) were probably filmed at a Poverty Row rental studio. In 1942 Monogram purchased a Poverty Row studio of its own in East Hollywood that had been used for movie making since 1912-1913 — initially by Essanay and then by Kalem, both A-list production companies of the 1910s. The studio changed hands in the 1920s and 1930s, devolving into a low-budget rental with two sound stages and a back lot. 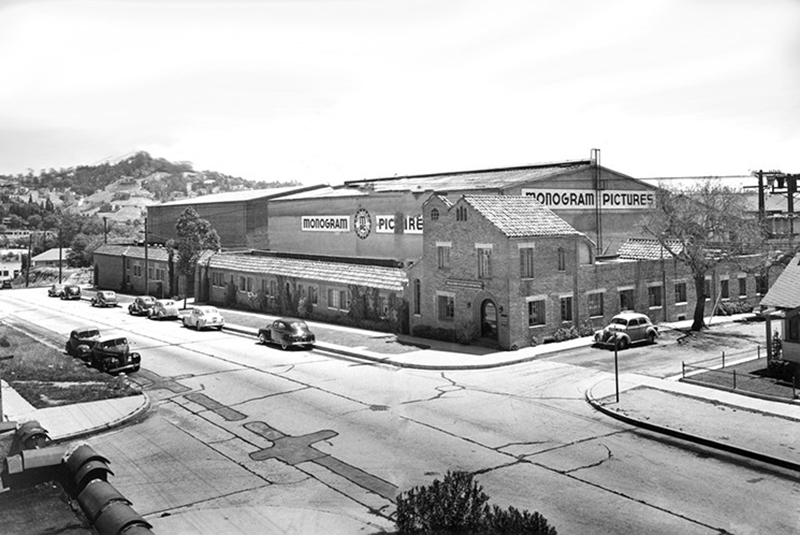 In 1942-1943, Monogram added a third sound stage, built a New York street and acquired additional property, expanding the studio to 1725-1735 Fleming Street (renamed Hoover Street), alternately known by its other frontage at 4401 Sunset Blvd. Monogram formed Allied Artists in 1946, the year Carr died, and used the Fleming Street/Sunset Boulevard studio until 1964 when Allied Artists moved to New York. The studio became a rental again until KCET-TV bought it in 1971 and renovated the old buildings. In 2011, KCET sold the property for $42 million to the Church of Scientology, which dramatically modernized the studio and reopened it in 2016 as Scientology Media Productions, the church's "global media center." It preserved the bones and bricks of the original buildings, which are a City of Los Angeles Historic Cultural Monument. They can be seen in this Scientology video from 2016-2017. Most of the "Monogram 9" with Lugosi used this studio for interiors. There weren't many exteriors in the Lugosi pictures; they were usually driving scenes filmed on Placerita Canyon Road near the movie ranch where Monogram was churning out the Western "buddy pictures" — just a hop and a skip from W. Ray Johnston's home on 8th Street where he could keep an eye on things. The "Monogram 9" are: Invisible Ghost (1941); Spooks Run Wild (1941); Black Dragons (1942); Bowery at Midnight (1942); The Corpse Vanishes (1942); Ghosts on the Loose (1943); The Ape Man (1943); Return of the Ape Man (1944) and Voodoo Man (1944). "Bowery at Midnight" is directed by Wallace Fox from a story by Gerald Schnitzer and Sam Robins. Credited cast includes Lugosi, John Archer, Wanda McKay, Tom Neal, Vince Barnett, Anna Hope, John Berkes, J. Farrell MacDonald, Dave O'Brien, Lucille Vance, Lew Kelly, Wheeler Oakman and Ray Miller. Uncredited are Victor Adamson, Willy Castello, Pat Costello, George Eldredge, Bernard Gorcey, Eddie Hall, Eddie Kane, Jack Kenney, Ralph Littlefield, Theodore Lorch, Walter McGrail, "Snub" Pollard, Bob Reeves	and Bobby Stone. LW3233: 9600 dpi jpeg from original lobby card purchased by Leon Worden.